The MT8500 Metallurgical Series for incident and transmitted light with Brightfield/Darkfield is newly designed and features Infinity Corrected Optics for reflected light observation. Meiji Techno's ICOS™ (Infinity Corrected Optical System) with all new and improved Epi-Plan BD Optics provide outstanding crisp images and a superior flat field of view while delivering an excellent cost-to-performance ratio. 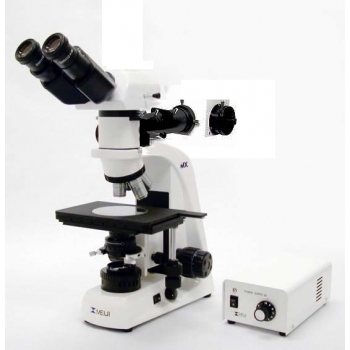 These microscopes are ideal for metallurgical applications. The configured models below all feature SWF 10X eyepieces with a 22mm field of view. Configured formats are available with your choice of either a Siedentopf type binocular or trinocular body. The nosepiece is smooth operating ergonomic and quintuple. Plan Epi BD 5x, 10x, 20x and 50x objectives are standard on the models listed. A ceramic coated stage with low positioned drop down controls makes for easy manipulation. A powerful 50 watt Vertical Koehler Illuminator w/auto voltage sensing power supply and 30w Transmitted Koehler provides enhanced image quality and brightness for the observation of metallurgical specimens. There are settings for Brightfield, Darkfield and Simple Polarized Light observation modes. Included are blue clear, green clear and neutral density filters in mounts. A variety of accessories are available including ergo tilting head, attachable mechanical stage, additional objectives, filters, micrometers and adapter tubes for photo, video or digital imaging. All Meiji microscopes come with a lifetime warranty. Model MA815 is the Siedentopf-type binocular head and Model MA816 is the trinocular head for camera integration. Each head has the eyetubes inclined at 30° with the left eyetube having graduated diopter settings. The interpupillary distance is adjustable between 53mm - 75mm. An 80/20 beamsplitter for the trinocular tube can be engaged for photo work. The optional Ergonomic Viewing Head has the inclination adjustable from 10 to 50 degrees to fit any size user. Meiji Techno offers an assortment of Plan Epi Infinity Corrected objectives for Brightfield work. Ceramic coated left or right-handed, flat top stage measures 191mm x 126mm with x-y travel: 100mm(X) x 100mm(Y). Ergonomically positioned coaxial drop down controls. Powerful 50 watt halogen vertical illumination along with 30W Transmitted Koehler Illumination provides super enhanced image quality and brightness for the observation of metallurgical specimens and photomicroscopy. Click the button below to add the Meiji MT8500 Metallurgical Microscope Series to your wish list.